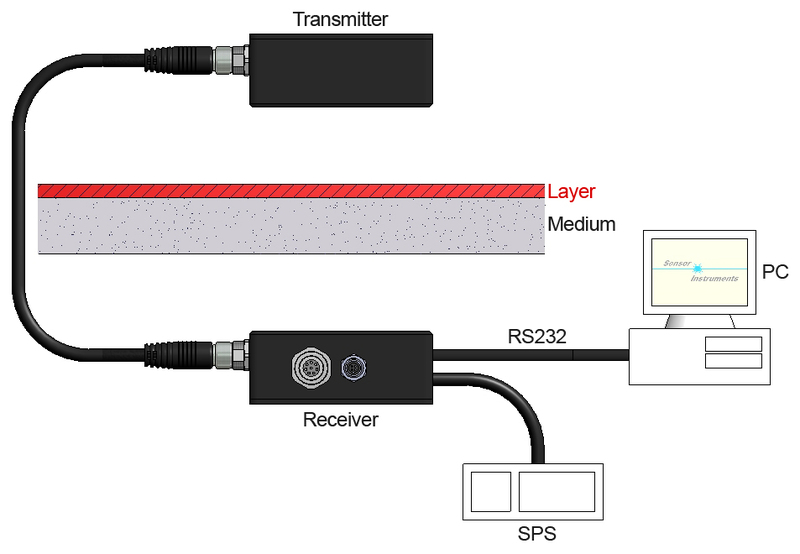 What is layer thickness measurement? Assuming that a diffuse thin layer (in the μm range) is applied to an optically transparent film (e.g. 100 μm thick), the thickness of the diffuse layer can be determined with high precision by means of optical transmission. An LED matrix is used as a light source [white light (VIS) or infrared light (IR with 860 nm)]. Depending on the composition and thickness of the layer a diffuse light source (SI-SLU-16-DIF or SI-SLU-16-DIF-IR) or a light source with small numerical aperture (almost parallel directional light) is used (SI-SLU-16 or SI-SLU-16-IR). 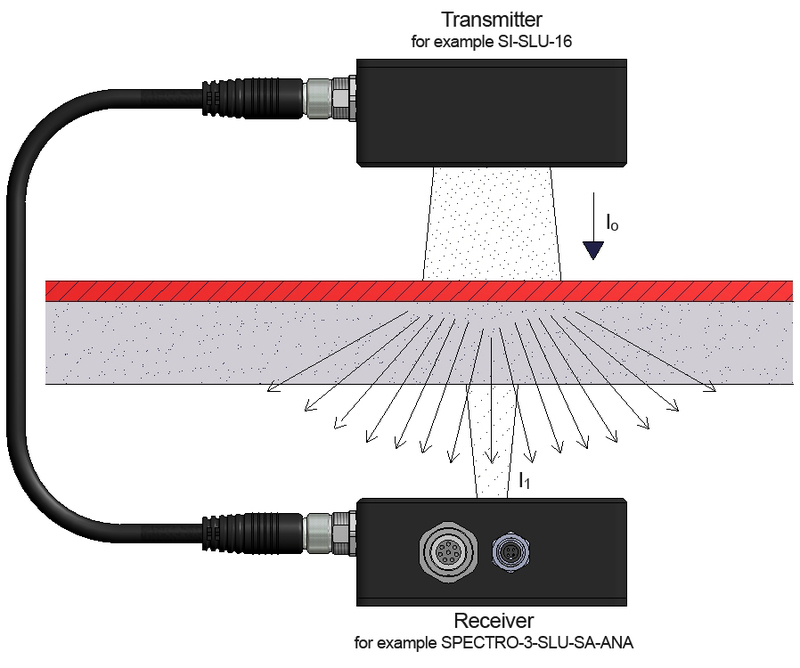 A so-called true-color color detector with small numerical aperture (small inlet opening) of type SPECTRO-3-SLU-SA or a contrast sensor for the visible light component (SPECTRO-1-SLU-SA) or for the IR component (SPECTRO-1-SLU-SA-IR) is used as a detector. Measurement is performed by way of a through-beam method, i.e. transmitter and receiver are arranged at opposite sides of the layer that should be inspected. When on the transmitter side the light impinges on the diffuse layer (I0) it is diffusely scattered by this layer into the complete space, and only a small part of the light reaches the receiver (I(d)). → I(d1) and I(d2) can then be measured. 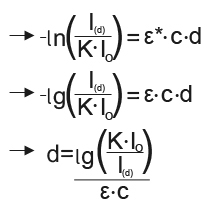 Furthermore, the constant K·I0 can be determined with the help of ε·c and I(d1) (assuming that I0 does not change during the measurement). The layer thickness is output by the measurement system (depending on the type) as an analog value (voltage or current) or through the serial interface.